Excavations during the Marmaray project had uncovered several archeological sites that would open a new chapter in the history of İstanbul, the Byzantine Empire and the world. These sites include secret passages, tombs, churches, works from the Bronze Age, ports, vessels and city walls that have been unknown to us until now. The archeological site at Yenikapı uncovered the ancient Port of Theodosius and with it, 36 sunken ships dating back from the fourth century were exposed to the light of day. Scientists at the laboratories of the forestry faculty at İstanbul University conducted several studies on samples from these ships to identify the trees used in their construction as well as their dates of construction. Akkemik said he has been analyzing the samples for two years. “The samples were sent to us after the sunken ships were salvaged. We conducted various tests and identified the materials used in building these ships. Four of these vessels were galleys. The rest were light commercial vessels,” he said. Akkemik notes that ship no. 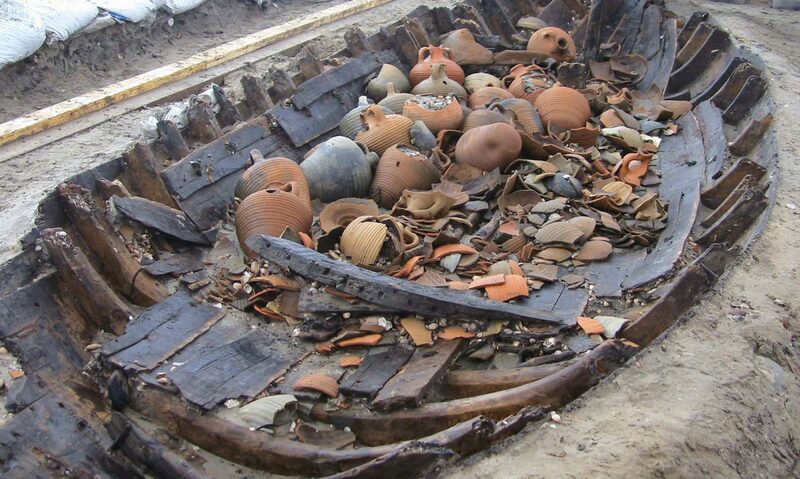 12 from the Yenikapı archeological site was the first vessel he examined in the group. “The trees used to build this ship were oak, chestnut, common ash, beech and walnut. All of these except for walnut can be found in the Belgrade Forest [in İstanbul]. This ship was probably constructed in or near İstanbul. Hard and durable woods from oak trees were used for the skeleton. Although oak is common in Turkey, we don’t know whether the oak used in this ship was procured from Turkey or elsewhere. It may have been procured from Romania or Bulgaria,” he said. Underwater cultural heritage is being damaged by urban resorts, industrial development and sport divers, according to a number of Turkish experts, who complained about the ineffectiveness of legal measures on the matter during a Monday meeting. “When you examine Law no. 2863, it is satisfactory from the perspective of protecting underwater cultural heritage, but the official sanctions are not sufficient. When a sport diver at 30 meters deep finds an amphora [a type of ceramic vase with two handles], he considers that a huge success and wants to keep it,” Dr. Ufuk Kocabaş, head of Istanbul University’s Department of Marine Archaeology, told the Hürriyet Daily News & Economic Review. Kocabaş, who is also in charge of the recent Byzantium shipwreck excavations in Istanbul’s Yenikapı district discovered during the construction of the Marmaray tunnel, was one of a number of experts attending the Regional Meeting on the Protection of Underwater Cultural Heritage, held at the Istanbul Archaeology Museum. Sport divers collecting amphoras makes work difficult for archaeologists, said Kocabaş, adding that an awareness of protecting culture should be fostered in the public through education. During the Yenikapı excavation project, which has been continuing for five years, 35 shipwrecks dating back to Byzantium were discovered. Kocabaş said they had completed the conservation of 23 of the ships and noted that a team of 600 workers, 50 archaeologists from the Istanbul Archeology Museum and 30 academics from Istanbul University cooperated in the endeavor. Asked whether the Marmaray project had damaged the ruins in any way, Kocabaş said it would have been hard for them to find the financial support to carry out such an extended study without help from the authorities undertaking the massive transportation project. “We couldn’t have found the financial support without the benefit of the Marmaray budget. Even though this is called a salvage excavation, we have the privilege of determining our own deadline,” said Kocabaş, noting that conservation takes a longer time. What is unique about the excavation is the discovery of Byzantine galiots, or warships, Kocabaş said, adding that researchers learned that technique applied was the opposite of what is currently used. “In contemporary ship construction technology, the skeleton of the ship is first prepared and the outer coat is applied later. But, the Byzantine galiots were designed completely in reverse,” Kocabaş said, adding that nobody knew how a galiot was constructed before the discovery. 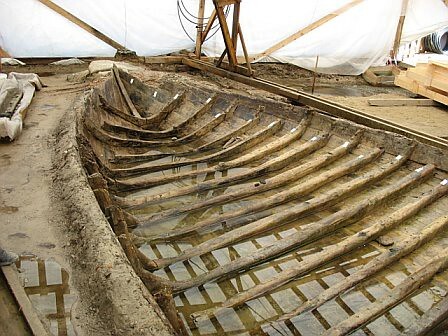 Thanks to this discovery, academics focused on the ship construction of the period, including the time span between the sixth century A.D. and the 11th, said Kocabaş. 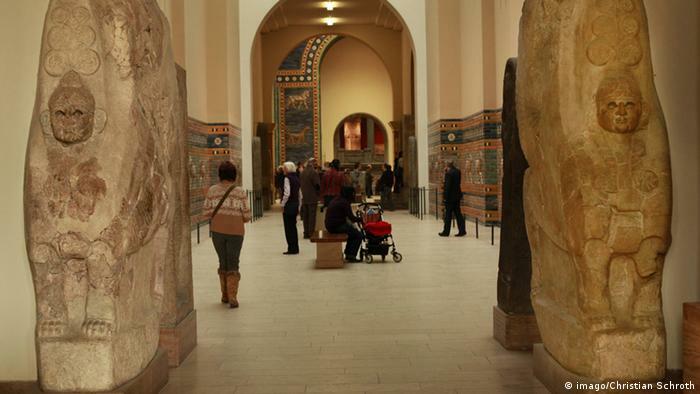 Within the scope of the project, a museum where the findings will be displayed will be created. “Yenikapı and the Golden Horn are some of the candidate areas for the museum to be located,” said Kocabaş. Replicas of the ships will be also designed so that people can enjoy the feel of being on an ancient ship. The most recent reports from Turkey about the Roman spa complex of Allianoi, sent by the local Allianoi Initiative led by the archaeologist professor Ahmet Yaras, says that now only the tops of excavated walls and columns poke through sand that workers employed by the Turkish State Waterworks are laying. This outstanding Roman archaeological site is being made ready to be submerged under water as work resumes on the controversial Yortanli dam. If the dam’s construction goes ahead and the valley flooded to create a reservoir, ancient history will be lost by an irrigation scheme with an expected life-span of only 50 years. Excavated by archaeologists only relatively recently, the ancient spa complex of Allianoi near Bergama in western Turkey has already revealed many historically rich monuments, including the thermal baths, bridges, streets and dwellings, and provided important scientific insights into Roman art, architecture, engineering, hydrology, medicine and pharmacology. Enlarged by the Emperor Hadrian, Allianoi dates mainly from the 2nd century AD, a time of emerging urban centers in Anatolia and of the construction of the famous Asklepion of nearby Pergamon. Europa Nostra immediately renewed its plea to leading Turkish politicians to save the site when we heard that work had begun to bury Allianoi in sand, in preparation for its flooding. We also informed the European Commission, European Parliament, Council of Europe and Unesco of our plea. We re-iterated our firm belief that should Allianoi disappear first under sand and then under water, this would constitute a breach of international regulations and covenants signed by Turkey, and would be contrary to the country’s own court injunctions. This latest plea continues our long-standing campaign in support of Allianoi and of finding alternative solutions to save it. In 2007, we joined forces with the International Council on Monuments and Sites and the European Association of Archaeologists to launch a public appeal to save Allianoi. So far, the combined local, national and European campaigns have managed to delay the dam. We now fear that the moment when Allianoi will be lost is drawing closer and closer. Back in 2006, the Turkish minister of culture set up a special scientific committee that recommended a series of alternative conservation measures which could be undertaken at Allianoi if the valley was flooded. These included the protection of the site as a sunken island by the construction of an earth wall, or the relocation of some of the archaeological site’s most important structures. These recommendations brought some hope for the future of Allianoi. We deeply regret that the Turkish government did not take those recommendations duly into consideration. Instead, it seems to have remained deaf to local, national, European and international pleas from concerned citizens and professionals alike. Yet, we continue to believe that it is still not too late for Turkish political leaders to take necessary action to avoid such a cultural tragedy to take place. Allianoi need not be sacrificed. In Allianoi, the issues at stake are clear: a significant European cultural heritage site will be lost along with the potential for tourism-led economic development in the area. Tourism based on the unsustainable model of large hotels on sandy beaches, might benefit those on the narrow strip alongside its coast but not Turkey’s vast interior. Sites such as Allianoi, which could be developed into a cultural and health tourism centre, would give deeper cultural and social meaning to the economic benefits of tourism, and would offer an example to follow also to other countries in the wider region, from Bulgaria to Syria. What will be lost is not only a site of archaeological importance, but also a tremendous opportunity for sustainable development. Turkey has an embarrassment of architectural and archaeological riches, from the Roman era to Justinian churches and Ottoman mosques. But the quantity and scale of these remains is no reason to deliberately sacrifice others such as Allianoi. The opportunity these sites represent—Allianoi included—is that of development led by sustainable tourism. Such alternatives require vision, long-term policy, bravery and leadership on the part of the government, but will undoubtedly pay dividends for Turkey and for the rest of Europe. The construction of hydroelectric dams and power stations in the Black Sea region is one of the main threats towards the cultural heritage of the ancient Mesopotamia region where river basins begot important centres of civilisation which lasted for thousands of years. Already, in south-east Turkey important cities such as Samsat have been affected by dams, and currently Hasankeyf with its important symbolic meaning for the Kurds, is similarly being threatened. Big construction firms and the support of international and national banks allow the financing and building of such mega-projects in Turkey. The environmental movement and Turkey’s fledgling heritage organisations are unfortunately still too weak when matched against big businesses and the politicians at national and regional levels who support such projects. The question of future water supply is going to be a difficult one for Turkey. The careful harvesting and marshalling of water can and should be balanced with Turkey’s other precious resource: its phenomenally rich and diverse cultural heritage, the potential of which has only been partially unfolded. The future prize—an expanding but sustainable tourism development beyond the coastal strip based on the respect and understanding of our common European heritage—must be worth it. 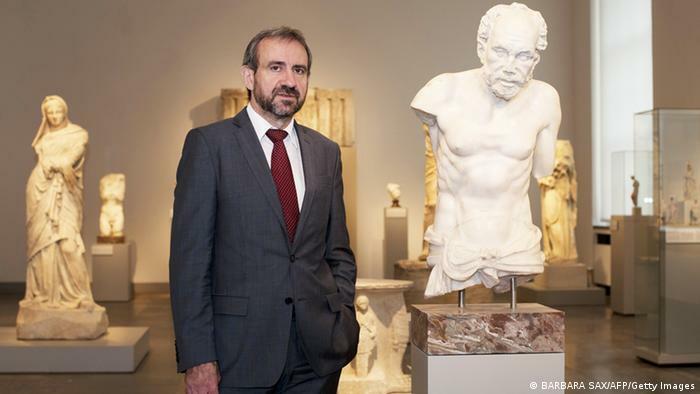 The writer is the secretary general of Europa Nostra, a European federation of heritage organisations committed to raise awareness of the value of Europe’s cultural heritage and to work to protect it for present and future generations. Ongoing excavations at the Heraion-Teikhos ancient city in the western province of Tekirdağ have unearthed a temple at the city’s acropolis. The temple, belonging to the ancient Thracian civilization, was thought to have disappeared in a fire that occurred in 2 BC. The continuing work at the temple has revealed many interesting artworks thus far, the excavation chairwoman says. The excavations, which have been conducted since 2000, have unearthed the ancient Thracian civilization for the first time, Atik said, adding that a team of 40 people, including workers, students, archaeologists and anthropologists, was carrying out the work. 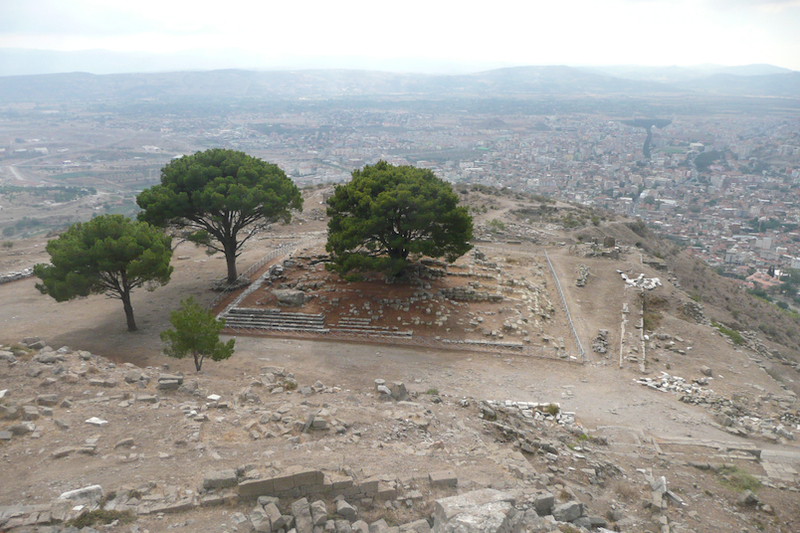 She said that they were working to uncover the temple at the acropolis (the highest hill) of the city. “According to the data we have, we thought that the temple burned down in a fire. We have so far removed statues of gods including Kybele, Eros and Aphrodite as well as bronze coins, amphora and similar pieces from the temple,” she said. This year’s excavations are continuing in the northeastern part of the city, the professor added, noting that they had found a square tower with two-and-a-half-meter-deep walls, resembling city walls, during the first excavations and had started to uncover the tower. “The tower is a solemn structure. It should be a part of a gate in the northeast. But we have not found the city walls that are connected to this tower. We understand that the walls were built for defense, because this tower is huge,” Atik said, adding that the acropolis covered an area of 300 meters and was surrounded by city walls. “It is possible to see the continuation of these walls on the coast. Some part of the hill is under protection, just like the tower,” she said. In just one week of work, the temple has yielded very interesting pieces of art, Atik said, noting that dogs were blessed animals in the Thracian civilization. “Dogs were sacrificed for good luck in this period. We saw light yellow spots in the earth when we first started the excavations. And then we found oblation valleys. We found the head of a bull last year, too,” she said, noting that the temple had three different phases. The excavations will continue for one month and the area should be set aside to allow the work to continue, Atik added. Stating that archaeological excavations need a lot of money and patience, Atik said they continued working with the support of the Tekirdağ Governor’s Office.